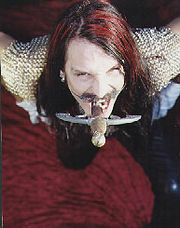 Mathew Henshaw (aka St Matty, aka Matty Blade) of Perth, Western Australia holds the world record for swallowing the heaviest sword. April 16, 2005, he broke a world record for the heaviest weight dangled by hanging a 20.1kg (44lb 4.96oz) sack of potatos off the handle of a 40.5cm (15.9in) long sword that he swallowed for five seconds. Mathew is also heavily tattooed wearing two full sleeves, chest and backpiece. This page was last modified on 7 February 2013, at 09:10.